The Bradley Property is 41 acres of forest parcel of land with a 2 mile network of trails located on Old Goshen Road in Williamsburg, Massachusetts. It was donated to The Hilltown Land Trust by Oliver Bradley Jr. and Barbara Rust on November 1st, 1989. 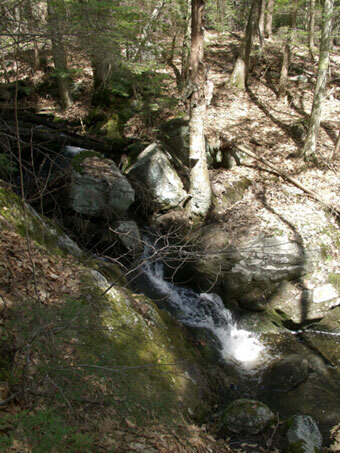 The east side of the property is bounded by Nichols Brook. A hilltop pine grove features a towering stand of white pine (and some large pines toppled in a 2017 wind storm). The trails form several loops, allowing visitors to choose between shorter and longer hikes. Previous owners of this property hand-built many of the rails and retaining walls along the stream. Since then, volunteers and the Hilltown Land Trust have maintained the land and trails. Take Old Goshen Road north off Route 9, 1.1 mi. west of Williamsburg village. 0.4 mi. from Route 9, bear left at the “Y” intersection with Hemenway Road, continuing on Old Goshen Road. 1.5 mi. from Route 9, look for the small parking pullout on the right, just after the road curves sharply to the right. The trailhead and kiosk are about 100 feet beyond the parking. Note that there are no rest rooms or other facilities at this location.